The outside of the bone consists of a layer of connective tissue called the periosteum. The outer shell of the long bone is compact bone with a deeper layer of cancellous bone (spongy bone) which contains red bone marrow. The interior part of the long bone is the medullary cavity with the inner core of the bone cavity being composed of yellow marrow. 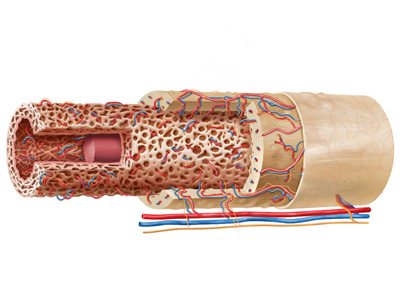 This image was used in patient education materials.